Christmas celebrations in Norway have already started. The whole month of December is full of parties and the most renowned is the “Julebord,” The Christmas Table, which is a company party thrown for employees or other groups to eat drink and be merry. Long tables are set for a giant sit down dinner, almost like a wedding and they are not reserved for just week-ends. Since I have been working backstage for many years during these events, this has always been a time for me to make an insane amount of food, fold hundreds of napkins, pour drinks, carry heavy plates and smile a lot! The kitchen dance is an amazing dance. If you have ever worked in the food industry then you know what I mean. After a hard day or night on that dance floor it is difficult to go home and do a repeat performance but sometimes I surprise even myself. There are no week-ends in December, here in Norway every day is a holiday. You can imagine what Norwegians are like at the end of this month…LOL… tired, hung-over and fat comes to mind. 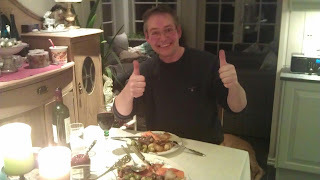 The other night this happy husband enjoyed a meal of filet mignon of deer, oven baked shallot onions and carrots, bacon seared brussel sprouts, sea salt damped baby potatoes, lingberries, and a wild mushroom/wine sauce. I was going to bake some cookies today but I am still full from last night. Have you been to any christmas parties, if so what are they like? Have you ever been ""Backstage" during one of these events?" Enjoy your celebrations where ever they may find you. Saturday, I plan to do some baking. Killer double chocolate cake. Chocolate chip cookies. And my To-Die-For-Peanut-Butter cups. We do Chrismakah at my house since we have a co-mingling of Jews, Christians, and Pagans in my family. Sir Poops and Hair Ball will be getting in contact with you soon. They need some Nosh for February. My husband would love that dinner too! I have a lunch feast next week at my son's preschool and then a Festivas celebration with friends on the 23rd. Lots of good food and good company. Cheers! A month-long party? I could handle that! I've been to a few Christmas parties, but I try to stay away from behind the scenes. They are SO MUCH work to put together. I've been to a Christmas party once, in Canada, where they urged me to finish dinner in 20 minutes and interrupted an interesting conversation with someone else at the party to go in the living room and unwrap the presents all together. I vowed that would be the last time I join a Christmas party. Will spend it, from now on, at home, with my mother, my aunt, and the pictures of our dog. hey you:) yep! I have. Both been working backstage for ten eyars, now attending:) julebord in norway.. don´t really know if I like them so much though. Nurse now, and it´s just... I don´t know.. hm.. anyways, thanx for writing and sharing. loving your blog:) merry x-mas! It sounds like a month filled with fun! I've been to one Christmas party so far at work. It's a pretty quiet affair with food, door prizes, and a gift exchange called "Dirty Santa." As I read this, it reminded me of living in Germany. The Christmas parties started early and were full of joy and laughter! Party hard in December, then diet hard and exercise in January. No, haven't been to any big parties like that. Hope your holidays are great! Good luck with the sales of that anthology that you and Roland are in! I'd gain ten pounds a week with that menu. I start cooking on Wed. Turkey, ham, candied apples, pumpkin pie, corn, mashed potatoes, apple pie, pumpkin bread, etc... Ah, guess I'll gain ten pounds from just tasting as I cook. Hi, I'm thrilled to find your blog this morning. Actually went to a work do last night.......very disappointing:( No food! A bar to buy drink and a DJ. Your parties sound grand! You are most likely winding down now... Her is only 3:30... SUNNY and COLD. Spending the holidays in Galena, a small town three hours west of Chicago. SNOWED yesterday... SOOO pretty. Today spent a few hours sledding down the mini mountains or LARGE hills. Taking a breather for an hour or so and then off to work out. Yes, even on vacation I work out. Baked up a storm all week and have been eating like crazy so I need to work it off. WHAT FABULOUS food for your holiday. I would definitely have to drop ten pounds before visiting. BUT what fun to put them back on. LOL. BIG hugs from you little Bro.